Apologize for my lateness in posting this week – I’ve been a bit buried in knitting samplers and developing curriculum for the wonderful classes coming up! 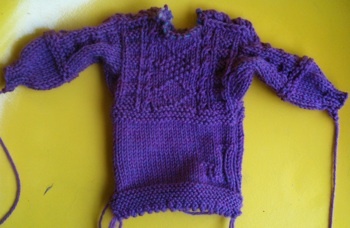 In last week’s class (week 3), we covered the shoulder straps and joins – probably the trickiest part of knitting a gansey. So take a moment and pat yourself on the back – your on your way down the mountain! 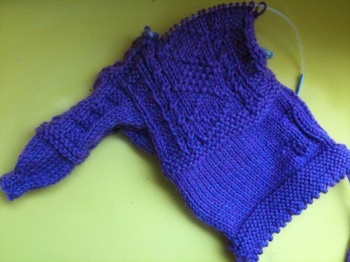 For unshaped neck lines that have vertically worked straps as shoulder extensions or for shaped necklines you will join your work at the shoulders with a 3 needle bind-off or grafting. We went over this in class, but just to reiterate, the homework is to complete the perpendicular strap and join for the Right and Left sides. Refer to Chapter 8 for the invisible cast-on pg 79, graph of shoulder strap pg 78 and you’ll find specific step by step directions for the straps on pgs 80 – 81. Take a break and with a cup of tea enjoy skimming through the photos depicting the sleeve in Chapter 9. 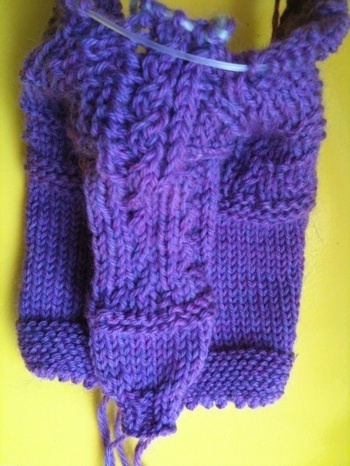 Close-up of the shoulder strap join with a baby cable running down the sleeve! Both sleeves complete - ready to tackle the neck gusset and neckline over the next 2 weeks.